Last week, for Women’s History Month, I shared the death certificates of my 2 grandmothers and 4 great-grandmothers. I then searched for death certificates for my eight 2x great grandmothers. All eight were born in other countries: Netherlands, Germany, and Alsace (now France). This one is for Alice Paak DeKorn, who died 5 May 1908 in Kalamazoo, Michigan. The cause of death is heart disease. Since she was only 55, that seems somewhat unusual. She is the woman who survived a terrible fire. Could that have caused permanent damage to her heart? Next up is Jennie Bomhoff Zuidweg who passed away 13 December 1924 in Kalamazoo, Michigan, at age 86 of senility. That cause of death as senility is a bit mystifying to me. Grandma remembered his grandmother. After all, he was born in 1908, so when she died he would have been 16 years old. He never said anything about her having dementia at all when he talked about her, and I have to believe he would have mentioned it. She looks pretty old in this photo, and she looks like she knows her own mind, so to speak. But can I quibble with a death certificate when I wasn’t there at the time? Alwine Noffke Waldeck died 9 June 1912 in Caledonia, Kent County, Michigan. She was 65 years old. The cause of death is “interstitial nephritis” and dropsy. Dropsy means edema, a subject close to my thoughts because I have lymphedema. Hmm, here is another kidney disease death, like the two in last week’s post. Only this one is on my mother’s side and not my father’s. Alwine is the mother seated in the middle. My fourth maternal 2x great grandmother was Nellie Gorsse Mulder who died in Grand Rapids, Michigan, on 12 October 1932. Cause of death was pulmonary tuberculosis, which she had had for 15 years. She also had had diabetes for 5 years. This is Nellie who died at age 63. I’ll be darned, but I don’t have a single death certificate or death record for these four women. Note that my maternal 2x greats all passed away in the United States, but the paternals did not (to my knowledge). Elisabetha Adelseck Wendel and Elisabetha Wink Klein were both born in Budesheim, Germany. Presumably they both died there. I wrote for records, but have not received a response. I am not sure how to obtain these records on my own if I can’t get responses to my emails. Same problem with the other two. Anne Reihr Schirmer from Leumschwiller, France, and Madeline Groll Scholler from Muespach, France. Again, I think they both died there. But nobody has responded to my requests. Until I can get those records, it’s hard to feel that they are “real.” I have no photos of these women either, but feel very lucky to have the four above. As to the 3x great grandmothers and beyond, I do have some records of many of the Dutch ones because the Dutch records are so easily available online. They makes things so much easier for me! Of course, none of these have causes of death listed. Any ideas on how to move forward on finding death records for the women from Germany and France? Because of Women’s History Month, I thought I would pull together information on how the women who came before me passed away. I wanted to put all my grandmothers together in one post and thought by sharing their deaths it would shed some light on their lives, at least at the end. I also have a ghoulish fascination with looking them over for the variety of ways I might die myself. After all, their deaths could be a form of inheritance. But what I discovered made me pretty mad at myself. I have so neglected death certificates. I think it’s because a death certificate in Michigan tends to be a document that I have to pay for that I have relied on social security death info, as well as burial info and death registry dates. I haven’t been assertive about going after the certificates themselves. This is why I don’t call myself a genealogist, but a family historian. I’m more of a storyteller than a rock solid researcher. Here are my grandmothers and great-grandmothers and how they died. My maternal grandmother, Lucille Edna Mulder Zuidweg, passed away on 21 September 2000 in Kalamazoo, Michigan, at age 88. After the death of my grandfather three months earlier, she was ill and living at a nursing home for round the clock care. The real round the clock care came from my aunt who slept in a chair in Grandma’s room. She was with her most of the time. What my aunt did is wonderful because Grandma hated being in an institutional place. She was like me about that, and it must have been horrible for her there. Thank goodness, she had her daughter with her. I didn’t have her death certificate, so I had to order it from Kalamazoo County. It arrived without a hitch. I see that the cause of death was congestive heart failure. The documentation gives no evidence of all she went through with the cancers that she had. The congestive heart failure might be explained by science in one way, but my explanation is that she died of a broken heart after losing my grandfather. My paternal grandmother, Marie Klein (Kline) Wakefield, passed away on 25 April, 1974, in Kalamazoo, Michigan. She had been living in the Upjohn Nursing Home, which at the time was the premier nursing home in Kalamazoo. Her ex-neighbor and friend, Shirley Kulp, was the head nurse so there was always someone to watch over Grandma. Grandma was 82. The above photo is my grandmother, Marie. In case you’re wondering about the difference in styles between the one of my grandmother, Edna, Marie was fully 20 years older than Edna. I didn’t have Marie’s death certificate either, so I had to order it from Kalamazoo County. Luckily, it came in the mail with my other grandmother’s certificate. Grandma passed away from uremia. I did remember that cause of death, although I had heard of it as a diagnosis while she was still alive, but dying in the hospital. This grandmother is who I inherited my congenital primary lymphedema from. Then there are my four great-grandmothers. Margarethe Wendel Klein died 24 May 1932 in Elmhurst, Illinois. I have her death certificate (woohoo!). I also have a corrected certificate. The only thing corrected is her birth date, and guess what? Both documents are wrong! According to the Catholic church books in Budesheim, Margarethe was born on June 25, 1869, NOT May 30, 1869 as it says on the death certificate and NOT June 24, 1870 as it says on the corrected copy. She died of a diabetic coma and also had nephritis and myocarditis. Her health had obviously been poor, although she was only 62–the age I am now. She had also already lost two of her five children, so she had been through a lot. When Margarethe died, her body lay in a casket in their house in Elmhurst. My father told me that there was a thunderstorm during the time it was there, and that the grandchildren were terrified at the combination of events and hid under the huge picnic table style dining room table. She was buried on May 27, but it looks like (from historical rainfall records) the storm most likely occurred the day after her death, on May 25. Francoise Schirmer (Schermer) Scholler died 22 October 1914 in Duluth, Minnesota. Cause of death at age 71: chronic nephritis and arterioschlerosis. Cora DeKorn Zuidweg died at age 57 on 16 September 1932 in Kalamazoo, Michigan. I have posted about this one in the past. Cause of death: Exhaustion – debility from gen – metastatic sarcoma spindle cell – primary in left thigh, followed injury was removed 9-16-29 – had existed there 5 years. Clara Waldeck Mulder died on 6 September 1953 in Kent County, Michigan, at age 69. I did not have her death certificate and ordered it from Kent County. I knew that she died of cancer, but I had eagerly awaited the actual cause of death on the certificate. When I received the document, I saw that cause of death was carcinoma of the uterus. That is what I had been told. Don’t tell me it doesn’t unnerve you a little when you see that your ancestors died too young, even if they were older people. Since my grandmothers were 82 and 88, I figured that was a normal lifetime. But when I add in the great-grandmothers’ ages at death the average goes way down. The average of the age at death of all six ladies is 71.5. The average age for the 4 greats is 64.75. I feel blessed that they were all old enough when they died to see their children grow up. Every woman doesn’t have that opportunity, obviously. And look at the pattern. All four greats died much younger than my grandmothers, so things are improving, probably from better healthcare. Of six grandmothers, I had three death certificates and was able to order the other three. Can I take it back another generation to the 2x greats? There will be eight women. How many certificates will I produce? A future post, peeps! I’d never seen this photo until about two years ago when I received it from my uncle. This is my paternal grandmother and her siblings (all except for Helen who was not yet born). I know that Elizabeth is the girl standing in back, the oldest and tallest. I know that Frank is in front. I had assumed that Grandma was next in height since she is child #2, and that that would mean that Anna is on our right. But now I think I could be wrong. Here’s a pic of adult Marie (my grandmother) with her three children (including my father on our right). Now here’s a photo from the same general time period of Aunt Anna, her husband Martin, and their daughter Annamar. I think that the face shapes and eye spacing would indicate that Anna is on our left and Marie on our right. That Anna is taller, in that case, than Marie is not inconsistent with their adult heights. Therefore, I think it’s possible that my earlier identification of the sisters in this photo is a case of an assumption that doesn’t hold up under scrutiny. My father knew I loved family heirlooms, so he used to give me items as he came across them. These are some of his mother’s costume jewelry with the jewelry box they were in. 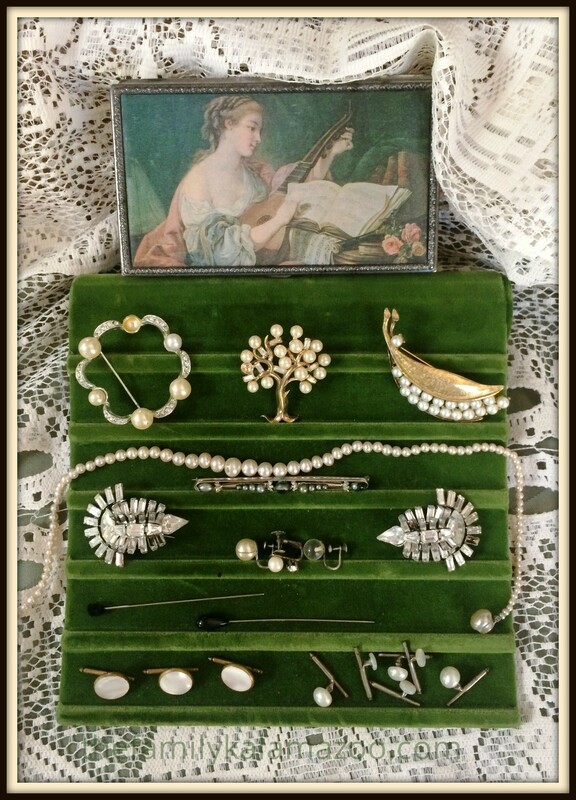 My grandmother always loved jewelry, but I only remember her wearing pearls (both cultured and costume) and diamonds and rhinestones. She may have worn jet, but I am not sure. The items on the bottom row are button studs. They work like buttons in a buttonhole, but are removable. These are usually used for men’s tuxedo shirts. On the second from bottom shelf are two hatpins. I remember those nasty little things from my childhood. You wouldn’t want to sit down on one by mistake! I suspect most of my grandmother’s jewelry came from Marshall Field & Company at State and Washington in Chicago. That’s where my grandmother worked as Head Fitter for many years. 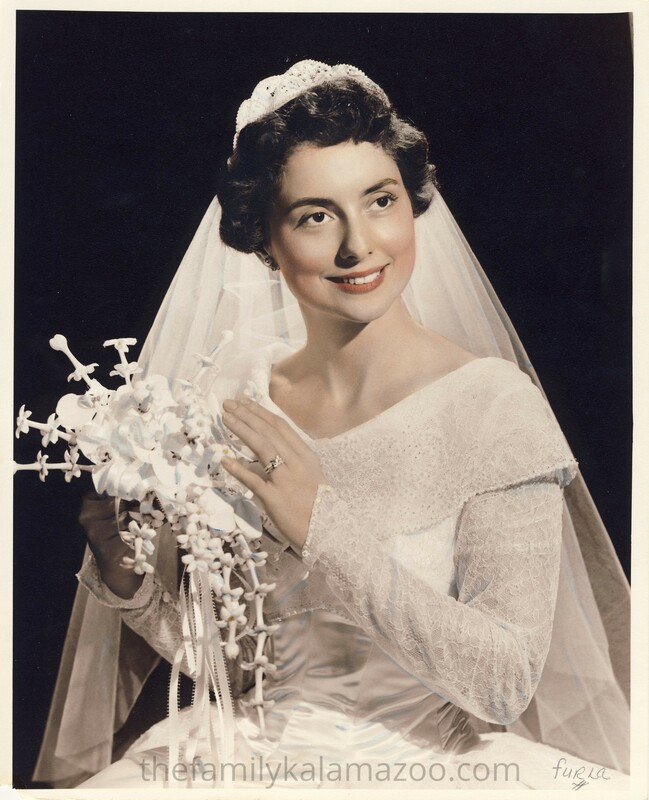 When I got married, it was only a year after my grandmother passed away. 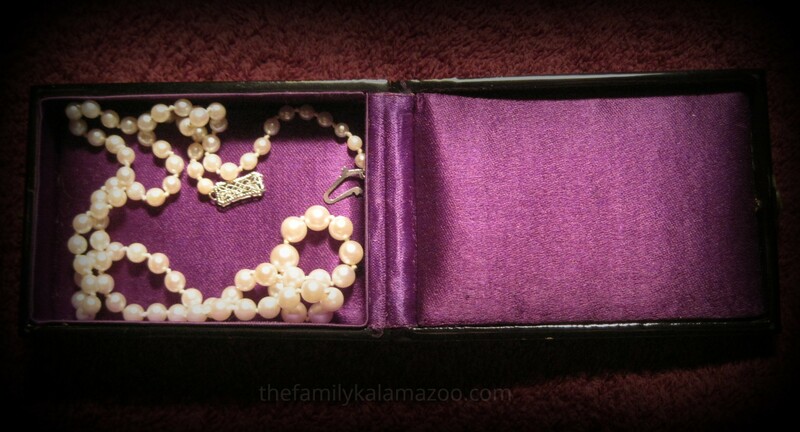 Her only daughter (who had three boys) sent me the wedding pearls Grandma had given her when she was married in 1955. They came in a Japanese black lacquer box. Aunt Marge did not wear them for her wedding portrait or on the day of her wedding. I am quite certain that my grandmother would have made her dress. Yeah, a lot of work. I have so many branches shaking their leaves for attention right now–and, no, I don’t mean on Ancestry. On top of that, my husband’s relatives are calling from their graves, too. My husband has shown increasing interest in his own family history, and I keep trying to encourage him into it as a personal hobby, even if it means he ties up the computer. But, no. He doesn’t want to do it alone. He wants to do it with me. Sigh. And his relatives are a lot of work. His Ukrainian ancestors don’t have a WieWasWie website that is translatable to English and with all the Dutch Ukrainian documents available online! No, instead I am being passed on from one person to another in an attempt to find someone who is an expert on Tiraspol, the city my husband’s grandfather and his family came from. Tiraspol is the 2nd largest city in Moldova, which is a country that is in political turmoil today. But in the late 1800s, Tiraspol was sort of a satellite of Odessa, which is in Ukraine, not Moldova. Pretty confusing! The two cities are 65 miles apart. And hubby’s grandmother might have been from Odessa. Or maybe she was really from Tiraspol, too! Oddly, we found a listing of possible birth records for the grandfather, Isidore Scheshko, and his siblings in Odessa, not Tiraspol. Maybe it has something to do with the way the government functioned in those days. Eastern European Jewish records are hard to find. I’ll keep you posted on what I find out when I have discovered enough to create a story of sorts. I’ve also been trying to find the Prussian town or towns the Waldecks and Noffkes and Kuschs came from. I’ve found two estates/castles where Gottfried Waldeck worked before immigrating to the U.S. The last one, Finckenstein Palace, was quite well known. That’s what it looked like when Gottfried worked there, probably as a farm laborer. This is what it looked like after WWII. Kind of heart-breaking to see, although maybe it was no picnic to work there . . . .
Prussian towns and records are super hard to find. Many of them were destroyed after WWII. The areas of what are now Poland that were once the homes of ethnic Germans are now completely emptied of Germans. And nobody can agree on what Prussia even was. The boundaries were constantly changing. There was East Prussia and West Prussia, and they are used so oddly and sometimes even interchangeably that every article I read confuses me even more (sometimes places in West Prussia are farther east than East Prussia!). Although my Prussian branch was my maternal grandmother’s mother’s family, I saw the other day that my paternal grandmother had a Prussian ancestor. That area of Prussia was very close to the German area around Bingen (on the Rhine) where her other branches lived. So when my grandmother told me as a little girl hearing “the Prussians are coming” was very scary, I don’t have a clue what she was talking about! Now I hope you’re as confused as I am! Who is That Mystery Woman on the Cover of Kin Types? Thank you so much for responding so enthusiastically to Kin Types. My new chapbook is an offshoot of The Family Kalamazoo, in a way. The cover of the book is from an old tintype belonging to my family. I have posted it twice before on this blog. The woman featured on it seems to have come from the Remine branch of the family and, based on the tintype and the dress she wears, I thought it was possible that she could be my great-great-great grandmother Johanna Remine DeKorn. This was a guess I had fairly early on, but I had no proof. But I knew she was someone close to us. For one thing, this is an expensive painted tintype and our family owns it. We wouldn’t have possession of such an image if it wasn’t someone from the family. For another, there is too great a similarity. For instance, my daughter thinks that the woman looks remarkably like my mother in the eyes and mouth. Other people say they can see her in my face. I thought it unlikely I would learn much more about the photo, but never gave up hope because much amazing information has flowed to me, mainly through this blog. When I visited my mother recently, she gave me a gorgeous antique photo album from my uncle for me to scan and disseminate. Imagine my surprise when I opened the album and found this tiny tintype inside. I had so many questions: Were the photos taken at the same time or is the woman younger in the couple’s photo? Same hairdo, same earrings . . . . We don’t really know about the dress and its neck accessory because the lace collar on the painted tintype is, just that, painted on. But she’s definitely younger. Is the new find a wedding photo? Are they siblings? So I focused on the man. I want to say boy. They both look so young. If the woman is Johanna Remine DeKorn, the man most likely would have to be Boudewyn (Boudewijn) DeKorn. Here is a photo my grandfather identified as Boudewyn, my 3xgreat grandfather. So, what do you think? Are they two different men? The hair is the same–very wavy dark brown hair–, but the hairline has changed. That’s possible. In the upper photo, the man has very defined cheekbones, and I don’t see this in the boy. The man has a very wide mouth. Would that change over time? I doubt it. It was unlikely then that the woman was Johanna, but who was she? I did what I had to do. I scheduled an appointment with photogenealogist Maureen Taylor. When I only had the painted tintype, I didn’t feel I had enough to go through the process with Maureen. But now that I had a second tintype, I wanted to give it a try. When Maureen and I began our conversation, I felt a letdown. Johanna Remine was too old to be in this photo. The tintype of the two people had to be between 1869 and 1875, according to Maureen. Johanna was born in 1817 and DIED in 1864. The woman could not be Johanna. The woman had to be a generation younger than Johanna. This was disappointing because I felt that I know the other branches or “lines” of the family, and that if she wasn’t Johanna, she couldn’t be a direct ancestor. And yet, as I told Maureen, I had a strong feeling that she was closely related. And her looks are too reminiscent of the family features to discount her. Maureen agreed with this and pointed me in a different direction. The Remine family, where I felt the painted tintype came from, began in the U.S. with a marriage between Richard Remine and Mary Paak. Mary Paak is my great-great-grandmother Alice Paak DeKorn’s sister. I am related to the Remines two ways. One is by blood, Johanna Remine being my 3x great grandmother, married to Boudewyn DeKorn (and the mother of Richard DeKorn). The other is by marriage where Richard married Mary. Mary and Carrie Paak, two of the four Paak sisters, had a similar look. Alice and Annie had a different look altogether. I asked Maureen about the man in the photo and said it did not look like Alice’s husband, Richard DeKorn. And then I learned something that is counterintuitive, but smart. She thought it could be her brother or even a beau she had in the Netherlands that she never married. In the tintype of both of them, they are very very young, maybe teenagers. And Alice immigrated to the United States when she was 17 years old. Maureen told me to ignore the man for the purposes of identifying the woman. I will try to identify him later, if it is even possible. The more I thought about Maureen’s assessment, the more I realized how blind I’d been not to notice the resemblance between the women in the tintype and my 2xgreat grandmother Alice. Alice also happens to be the mother of Cora, the woman my grandparents told me that I look like. Just for fun, I ran the two images through twinsornot.net. This is the result, although they photos are of a very young woman and a woman twenty years older. Then I pulled out the other photo that Grandpa had identified Alice. In this alternative photo, Alice is younger than in the 1890s photo, but not nearly as young as the tintype. I had never been sure that this photo even was Alice, although Grandpa had been (and she was his grandmother). So I ran both Grandpa-identified Alice photos against each other on the site. 100% match! Grandpa was right. Next I ran the tinted tintype against this alternative photo of Alice. SO THERE YOU HAVE IT! THE MYSTERY IS SOLVED. THE WOMAN ON THE COVER OF KIN TYPES IS MOST LIKELY ALICE PAAK DEKORN. I learned a lot of lessons through this process, but one that really stands out in my mind is that people look different in different photographs–and when you are comparing people of different ages, it really gets dicey. I think about photos of me . . . If you click the Amazon link , the book can be ordered for $14.99. To order through Barnes & Noble, try this link. Although I started this blog five years ago next month, and that sounds like a long time, I’ve been working (on and off–mainly off while raising my kids and teaching) on family history, family photos, and genealogy since I was just out of college and beginning a master’s in history (which I did not complete and ultimately switched to English and creative writing). I was blessed with many antique and vintage photographs and a grandfather with a great memory and a talent for storytelling. But it wasn’t until a couple of years ago that I got the idea of putting my research and knowledge of our family history together with my creative writing. Then I began to write lyric poems, prose poems, and a few pieces in a genre that was new to me–flash nonfiction, which is a form of very short prose–based on individuals from my family’s past. Ultimately, I pulled these pieces together into a chapbook (44 pages) which has been published by Finishing Line Press and is now available, not only on their website, but also on Amazon and Barnes & Noble websites. Kin Types looks at what the lives of my ancestors were like. The locales are mainly Kalamazoo (and other towns in southwestern Michigan), Elmhurst (Illinois), and the Netherlands. Using the fruits of my research, which included studying newspaper articles, documents, and the details of antique photos, I tried to “inhabit” the lives of some of the people who have come before me. If you click through the link to the Amazon page, the book can be ordered for $14.99. To order through Barnes & Noble, try this link. like deer bones after a storm. from under their fathers’ names. like a cross polished by many hands. and their babes buried along the way. If you read this blog, some of the characters of the book might be familiar to you. And because the project is quite unique I think people passionate about family history, genealogy, history, and local history will probably be particularly interested. Some of the pieces have been published in literary magazines. Combined together, they tell a story of the history of “forgotten” women. So what are you waiting for? 😉 Go to one of the links and place your order! And thank you very much.